Who doesn’t enjoy feeling relaxed and pampered? For most folks, a day at the spa getting relaxing body treatments and feeling pampered is a welcome respite from the everyday grind. A body wrap or massage can rejuvenate not only your body, but also your spirit! What if you could have that same relaxing experience at your dental appointments? Your dentist in Park Slope wants to tell you about dental spas, and how they’re revolutionizing dental appointments. A dental spa offers relaxing and stress-reducing amenities such as massage chairs, aromatherapy, hot beverage bars and other spa treatments to patients while they’re receiving or waiting for their dental procedures. Patients receive high quality dental care with an extra emphasis on personalized care and patient comfort. Dental spas also typically have a strong emphasis on cosmetic dentistry, offering different types of bleaching, porcelain crowns and veneers, dental implants and many other services designed to improve and enhance your smile. 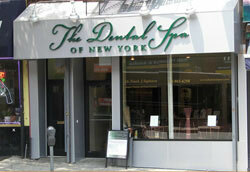 At The Dental Spa of New York, Dr. Frank J. Sapienza has been creating beautiful smiles for over thirty years. As your premiere 11215 dentist, Dr. Sapienza offers a number of cosmetic services using only the highest quality dental materials and the most advanced technology to restore beauty, form and function to your smile. Using imaging technology, he can even send you a preview of what your improved smile will look like with only a current headshot from you. Offering stress-reducing amenities such as freshly baked bread and cookies and a full beverage bar, serving cappuccino, tea, and juice, The Dental Spa of New York offers ultimate patient care. You can enjoy a reception area with a flat screen TV and massage chairs to help you unwind and relax while you wait for your dental care. We also provide patients with comfort blankets & pillows, warm lemon-scented towels & music headphones. Beyond these amenities, and above all is a warm caring staff that is dedicated to making your dental experience as pleasant and comfortable as possible. Besides offering professional cleanings and other preventative services, Dr. Sapienza has extensive training in advanced dental services such as dental implant restoration, cosmetic veneers and porcelain crowns, and full mouth reconstruction. Whether you need your bi-annual check up or you’re looking to completely change the appearance of your smile, you can rest assured that you will be getting high quality care from the team at The Dental Spa of New York. If you’re ready for the ultimate dental experience, don’t hesitate to contact our office today to schedule your appointment. We can’t wait to meet you!